Owner Pat McDonagh and wife Una netted a major windfall during the year. PROFITS SOARED AT the company behind fast-food chain Supermac’s last year, more than doubling to just under €12 million. According to new accounts just filed by Supermac’s Ireland, the company had sales of just over €116 million in the 12 months to the end of 2015, up nearly one-quarter on the tally for the year before. The firm, which is owned by Galway entrepreneur Pat McDonagh and his wife Una, who set up the first outlet in the chain at Ballinasloe, County Galway in 1978, made an operating profit of just under €14 million compared to slightly under €10 million in 2014. After paying out about €2.2 million in taxes, Supermac’s was left with a net profit of €11.9 million – more than double the €5.7 million reported by the business the year before. 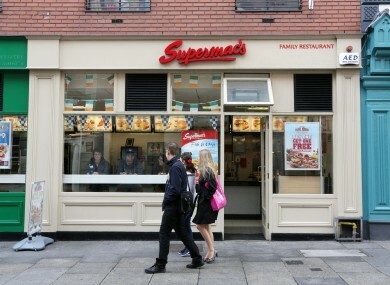 An average of 1,336 people were employed by Supermac’s Ireland during the year, up from 1,032 the year before. This resulted in staff costs rising from about €22 million to just over €27 million. The accounts also show that Pat McDonagh and his wife Una received a major windfall during the year, as Supermac’s Ireland purchased property from the pair at “open market value” of nearly €27 million. Some €10.4 million was still due to be paid to the couple at year-end. As well as owning more than 100 Supermac’s outlets, McDonagh also owns several hotels, fast-food outlets and motorway petrol stations – most notably his Barack Obama Plaza in Offaly. McDonagh said at the start of the year that Supermac’s expected to open six new branches during 2016 in a move that would likely create at least 200 new jobs. However, while it continues to expand across Ireland, the chain has apparently been stymied in its plans to move into mainland Europe and Australia due to opposition from American fast-food giant McDonalds. Email “Supermac's is raking in the cash as profits more than double to €12m”. Feedback on “Supermac's is raking in the cash as profits more than double to €12m”.